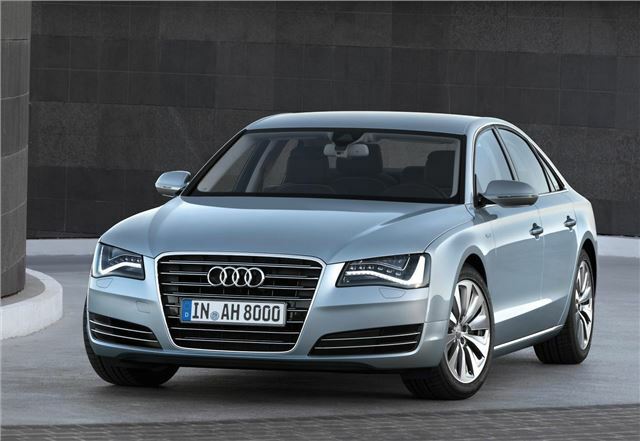 Audi is to launch a hybrid powered A8 in early 2012. It’ll have 245PS and yet still manage in excess of 44mpg on the combined cycle, with CO2 emissions below 148g/km. It’ll be available in the UK later in 2012. Power comes from a 211PS 2.0-litre TFSI petrol engine linked to a 54PS electric motor in a parallel hybrid system. The combined output of the two means peak power is 245PS and 480Nm of torque. Early tests indicate a 0-62mph time of 7.7 seconds and a top speed of 146mph. The A8 Hybrid can travel at speeds up to 62mph on electric power alone, with a range of 1.86 miles when driven at a constant 37mph. The driver can choose an EV mode, a ‘D’ mode, which optimises the car for efficient, and ‘S’ mode, which improves acceleration. The battery which powers the electric motor is stored in a crash proof area in the boot, and is cooled either by air from the cabin or by the air conditioning system. It’s kept at an optimum temperature to deliver the best performance. The A8 Hybrid is distinguished from the rest of the range by unique alloy wheels, as well as hybrid badges and an exclusive Arctic Silver paint finish. Three-zone air conditioning, LED headlights and BOSE audio are all standard equipment. More details on pricing and will be made available nearer the launch date, which is as yet unconfirmed.